If there’s one slight drawback to this excellent camp site in Huisseau-sur-Cosson, it’s that charcoal barbecues are not allowed. That’s a common restriction in the south of France where there is a significant fire risk but it’s unusual this far north on La Loire. We had rain this morning so spent the time on necessities like food shopping and buying an Aujour d’hui newspaper with weather maps. It looks as though things should brighten up here for the coming few days. It also seems that Usain Bolt has been entertaining people in night clubs as well as on the track. I guess Aujour d’hui is principally a gossip paper. Our principal interest is its four days of weather maps; very handy for sun-seeking travellers. The rain ceased and George, our lean, mean, fat-reducing grilling machine and general barbecue substitute, was pressed into service preparing grilled asparagus with goats cheese for lunch. As the afternoon continued to brighten, we took to the bikes for some exercise and a visit to chateau Chambord. It isn’t very picturesque at the moment, though, ‘cos there’s a bunch of scaffolding around a few of its many towers. I did cycle by a pair of very picturesque cycling female gendarmes on the approach but Carol had the camera and besides, I didn’t want to get arrested. 🙂 I’ve cycled carrying a few things but never a gun. We continued on one of the many local cycle routes and had covered 23 miles as we returned to our pitch. 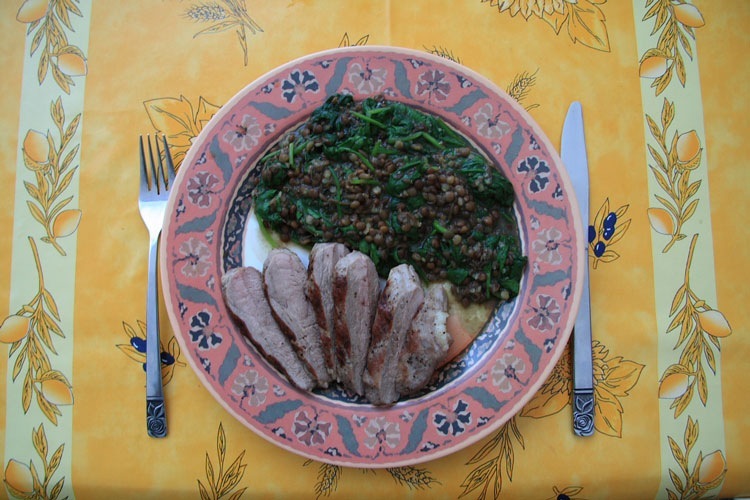 George sprung into action yet again to reward us with a splendid grilled magret de canard (duck breast) accompanied by lentils and wilted spinach. That really must be my five-a-day today. I call it the George Foreman Lean Mean Dry It Out Machine. You’re absolutely right – it’s nothing like hot enough to sear the outside before cooking the inside of a steak. Works for some things, though. Now I see the piccie of the food, I know you’re in France!